We are dreaming. We desire utopias. We treat ourselves with placebo drugs and we are hypnotized by all of the above. The symptoms started in Japan in the early 1990s. It has been called Japanese malaise and it seems that is spreading. Subpar GDP growth rate, interest rates stuck somewhere in the twilight zone of zero percent, with fixed capital investments awakening only during supper time, a banking sector with huge collateral holes, an inverted asset pyramid whose crown jewel is the derivatives market, with nations suffering from a debt hangover, and ageing populations that have no idea how unfunded liabilities will be covered. Welcome to the age of complex disequilibrium characterized by diminished expectations. In this age, the economic unfolding has little to do with secular stagnation (a misconceived notion circulated in 1938 by Alvin Hansen who dreamed of a permanent stagnation due to declining GDP growth rate despite low interest rates) but more to do with a very complex world where the interaction among the different factors and actors create a landscape that resembles more of a world in a stage of confused disequilibrium. Thierry Malleret has produced a powerful picture of this age, as shown below (click image to zoom in). 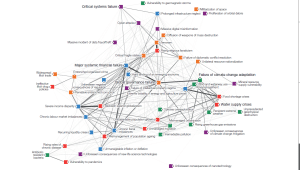 The interconnectivity of factors and actors has become so complex that the issue is no longer finding equilibrium, but rather stabilizing what seems to be a permanent disequilibrium. Unless that happens Goya would need to come back and paint again the modern Cronus eating his own kids. The discussions of interest rate normalcy seem to be missing the point. The issue is not about the deleveraging shock due to the amount of debt circulated. This would have been relatively easy to solve when nominal rates dropped to almost zero since 2009, and certainly two decades would have been enough to move Japan away from its malaise. One of the main concerns in the secular stagnation literature is the establishment of an achievable rate of inflation high enough to overcome the negative real interest rates. This myopic view of the real complex situation has led to misguided policies of forward guidance regarding interest rates. 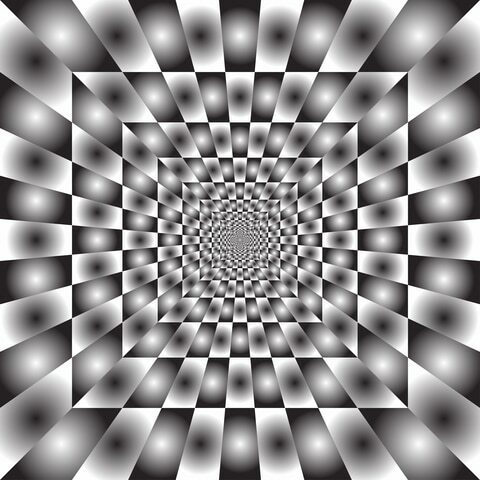 Complex economies cannot be escaping their labyrinths by forward guidance on interest rates because expectations can be manipulated up to point and forward guidance cannot manipulate complexity. Similarly, fiscal policies of tax and spending cannot unwind the disequilibria generated by complexity where actors are lost amidst the factors that form them. Let’s look at a simple example below. Despite aggressive monetary and fiscal policies in the EU, competitiveness is still suffering, leaving a lot to be desired. 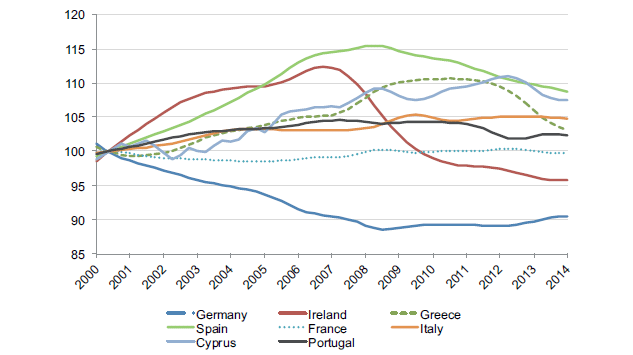 The graph below shows the real effective exchange rate of several EU countries. It assesses the country’s competitiveness in the currency union. As it is obvious Spain, Cyprus, Greece, Italy, Portugal, and France are way less competitive than Germany. Thus, despite the unorthodox fiscal and monetary measures taken, the cure does not seem to be in those traditional policies, but rather in the structure of the EU. The complexity of the EU’s structure (and for that matter of the global structure) prevents fiscal and monetary – orthodox and unorthodox – tools to work. As we have stated before, our anticipation is that we will be dragging along the lost path for possibly another two-three years, in which the adopted policies (Sisyphus pushing the rock uphill) will create opportunities for profits. However, the cautionary tale is not about the next shock and its magnitude, but rather on whether a deus ex machina reverts to the principle of parsimony. Ode to simplified structures that avoid the superfluous ontological apparatus!